Attorney Norm Pattis, who is representing Sherman resident and Georgia prison escapee Robert Stackowitz, is asking Gov. Dannel P. Malloy not to sign paperwork that would send Stackowitz back to Georgia. Pattis has argued in interviews, his blog and a newspaper column that Stackowitz, 71, is too sick to return to face charges for the escape from a prison work camp in 1968. He also argues that Stackowitz is rehabilitated and points to his crime-free life in Connecticut since then. Stackowitz had served about two years of a 17-year sentence after being convicted of robbery by force when he escaped. 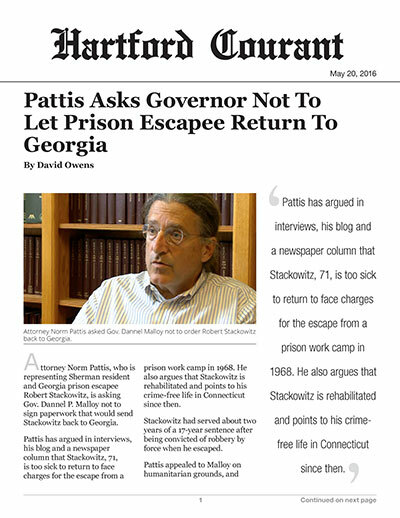 Pattis appealed to Malloy on humanitarian grounds, and in light of Malloy's advocacy of a Second Chance initiative for some crimes, to not sign a warrant that would return Stackowitz to Georgia. The Second Chance initiative, as drafted, would not apply to Stackowitz's crime: robbery. Malloy's spokesman had no comment when asked about Pattis' appeal on Friday. A spokesman for Georgia Gov. Nathan Deal, who would issue the governor's warrant seeking Stackowitz's return, could not be reached for comment Friday. Steve Hayes, a spokesman for Georgia's Board of Pardons and Paroles, said last week that Stackowitz must return to Georgia so the agency can review his case and determine what action to take. Typically, according to Connecticut prosecutors, the state's governor plays little or no role when a state demands the return of a person charged with a crime. If the person does not waive extradition, the governor of the demanding state issues a governor's warrant seeking the person's return. That warrant is presented to a Superior Court judge whose review is limited to whether the extradition documents are in order, whether the defendant has been charged with a crime in the demanding state and whether the person in court is the person named in the governor's warrant. Under the Uniform Criminal Extradition Act, and according to a state Appellate Court decision in another case where a man was fighting extradition from Connecticut to Georgia, "the governor of this state has a mandatory duty to comply with a demand by the executive authority of another state for the extradition of any person who, have been charged with a crime in the demanding state, is a fugitive from justice."